Please select a subject, category then continue. 1. What is the address and postcode for Ebbsfleet International? 2. What is the contact number for Ebbsfleet? 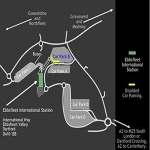 If you have questions that relate to travel from Ebbsfleet International railway station, then try out the FAQ or please feel free to contact us from the form above. Customers with international train journeys should contact Eurostar for more information. For any other queries regarding domestic UK train services (only), please contact Southeastern railways - www.southeasternrailway.co.uk/ on 0845 000 2222.